Tickets sales are open for Pug Crawl 2019. Purchase them here! Tickets: $10 in advance; $15 at the door. Children age five and under free. Purchase tickets here. Who: People and dogs of all ages! The Parade of Pugs is open only to pugs and pug-mixes, but all dog-friendly dogs are welcome at the event. 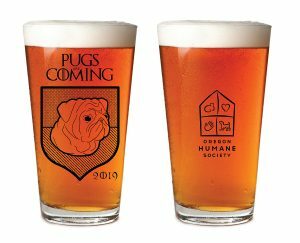 Don’t forget to buy a pint glass! You can purchase one when you buy your tickets or at the event. Show your support for animals by becoming an event sponsor. View the 2019 sponsorship packet here. Customize your package by contacting Rose Williams at [email protected] or (503) 802-6803. Interested in being a vendor at the event? View the 2019 vendor packet here or contact Stephanie Kittrell at [email protected] or (503) 416-5026. See the full list of sponsors below. The Parade of Pugs is the highlight of Pug Crawl and begins at 2pm. To register your pug or pug-mix for the parade, visit the Oregon Humane Society booth the day of the event to sign up. Participation in the parade is free once you are registered for the event. Judging the Parade of Pugs is no easy task. The panel of judges deliberates long and hard over all the entrants. Factors considered during the costume judging include: interpretation of the theme; creativity; costume stability (few or no stops for adjustments along the route); and the time and effort that went into building the costume. Social: On Instagram and Twitter, tag your Pug Crawl photos and posts with #PDXPugCrawl and see them on our website here! Thanks for joining us at Pug Crawl 2018! Photos from the event available to download for free. Click here!